Thinking of being Santa this holiday season? It’s a great way to get into the holiday spirit and enjoy the Christmas season. Embrace the positive energy of the Christmas season, as well as the excited kids. Remember, it’s your job to always, always, always stay in character. Below are 5 more great tips that will make your, and the children’s, experience magical and memorable. Begin by reading through the 19th-century poem, “The Night before Christmas,” by Clement Clarke Moore, which is where many of Santa’s traits originated. Also important to know is the meaning behind Santa’s red-and-white suit—the red is a symbol for “a healthy outdoorsman,”. While you’re in that red suit, you’d better be on your best behavior. If you want to fully portray the jolly old elf, you’ll have to sing. Start with learning the words to “Rudolph the Red-Nosed Reindeer,”. If you know that song, then you know all the reindeer names. 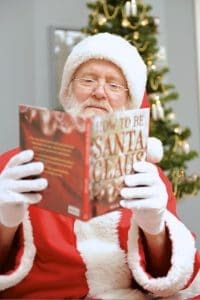 Answering probing questions from curious children comes with the territory of playing Santa. A common query is “Are you the real Santa?” respond by saying, “I’m the spirit of Christmas, and I stand for love and giving”. Another frequently asked question: “How do you get around the world in one night?” it’s important to explain that there are 24 different time zones, giving Santa plenty of time to get across the globe. Take a tour to a nearby Toys ‘R’ Us to learn about the newest and most desired toys and gadgets. Keeping up with the hottest technology is crucial to playing Santa. It’s important to know the toys because then you can develop that conversation with the children.